The "T" style draft beer tower is perfect for a bar or restaurant with a wide variety of draft beers. 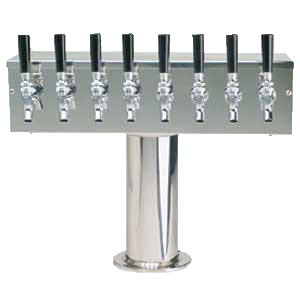 The "T" draft beer tower allows up to eight different drafts to be dispensed from the same beer tower. The 3" style allows for three different taps and the 4" style allows anywhere from four to eight taps, making it ideal for beer gardens and other draft beer hot spots. Constructed of high quality stainless steel that won't pit or chip like chrome, this tough draft beer tower is sure to withstand the test of time. This draft beer tower is gylcol cooled with Kool-Rite technology and NSF certified. "T" Style Draft Beer Tower with 3 Faucets. Made of PVD Brass & Glycol Cooled. Constructed of stainless steel and plated with PVD Brass that is tarnish and scratch resistant, this draft beer tower will hold up to the demands of your bar or restaurant. This draft beer tower is gylcol cooled with Kool-Rite technology and NSF certified.